Well That Didn’t Exactly Go As Planned! What I find most disturbing about MadBum’s two outings is not the drop in velocity for his cutter and fastball. It’s the lack of command and nibbling. If you watch Bumgarner carefully, even when he is on, he has a tendency to aim the ball, which is supposed to be a no-no for pitchers. It has worked for him often in the past but last night and in his first start the roughness of the outings was pronounced. Pitching from behind with diminished stuff is a recipe for disaster. The Miami Marlins were a three-headed monster last night with J. T. Realmuto and Brian Anderson (who appears to be the next Willie Mays) combining for 25 hits, 9 homers and all the runs and hopes between them. This is not a good Marlins club folks. When the Giants score 5 with their ace pitching against a AAA team gutted by ownership even worse than that of Jeffrey Loria (who would have thought that even possible?) the obvious inference is a win. Baseball is funny that way. The Giants take out Scherzer behind Derek Holland a lights-out bullpen. One day later they get beaten up with their ace on the mound by a bunch of young baseball up-and-comers. Sure, the Giants got the lead in the seventh but Dyson and Moronta would cough the game up. The Giants had three leads vanish last night. It might just be one of those games with the lads taking the opposition too lightly. I am not going to Joe Panik about MadBum’s stuff yet. I think he is simply showing signs of rust and he just may not be Super-Human after all. Baseball is hard folks. Pitching to the greatest hitters in the world, including the Brian Anderson sensational rookies, requires practice, precision, and preparation, all of which Bumgarner was short-changed on in his zeal to rescue the Giants from starting pitching oblivion. 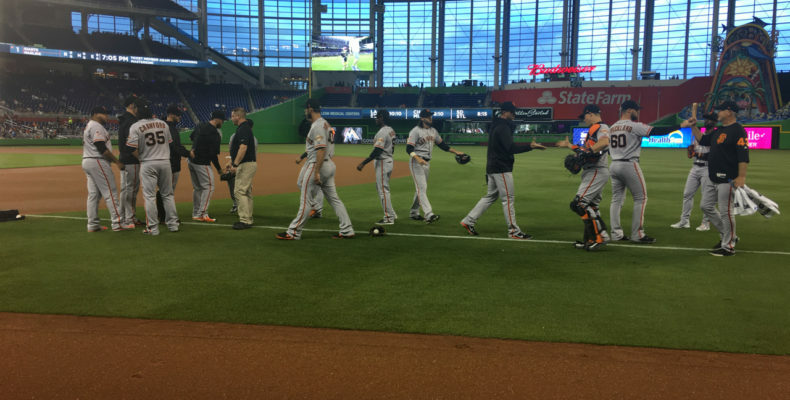 With three games left in Miami the hope is the Giants can take at least two on their way to a big three-game series in Los Angeles for the weekend. Surf Maui and I will be rooting the boys on again at the park. Last night the announced attendance at Marlins Park was 6,009 or something. It was far less than that in truth. There could not have been more than 3,500 people in the air conditioned Little Havana storage cavern. What a disgrace Paul Manfred, that you allowed this to happen. The people of Miami deserved better than Jeffrey Loria, a man who sued a Marlins season ticket holder and attempted to seize his property, and instead they got worse. To learn more about Jeffrey Loria, read this, and this. Derek Jeter will receive millions of dirty dollars in bonuses if he makes the Marlins profitable, which means getting the payroll below a certain threshold, after he fired staff, many of whom worked years for the team, without meeting them in person. To my critical eyes that overpay of $1.2 Billion for this franchise reeks of dirty money laundering and a variety of other financial misdeeds, crimes and sins. If MLB and Manfred had a shred of decency and cared at all for what happens to this team and these fans they would never have approved this sale or they would have at least stepped in to stop the purging and dumping of excellent players. 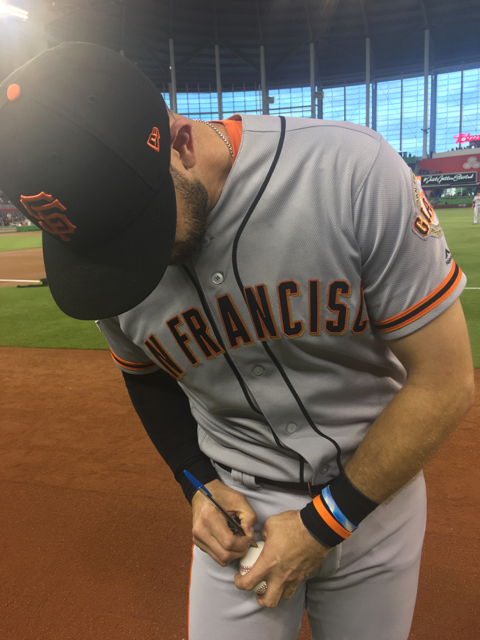 A trip to see the Giants in Miami is still always worth it, if for no other reason than you just love the game and you can get front row seats for practically nothing. The city is fun, full of vibrant night life, a unique hispanic blend of tastes and sights, and beautiful architecture. Miami is a city that is mostly thriving culturally and has left sports behind as an afterthought thanks to horrible ownership of all three of its teams (Dolphins, Marlins and Panthers). Be grateful Giants fans, for the wonderful and wise ownership we have. We could have easily ended up like the Marlins. Tonight, Chris Stratton pitches against Trevor Richards at 7:05 PM.